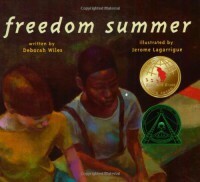 Freedom Summer by Deborah Wiles is a beautiful story of friendship between John Henry (a young black boy) and Joe (a young white boy) in the 1960s. The two boys spend their entire summer together, going on adventures and making unforgettable memories. As the boys spend time together, Joe begins to notice all of the things John Henry can't do and all of the places he is not allowed into simply because of this skin color. But despite this, the boys become close friends and embrace each other's differences. This book has a great variety of vocabulary that readers can learn from and excellent illustrations that paint an accurate picture of the South during the 1960s. I would use this book during a Social Studies lesson and ask students to compare and contrast John Henry's and Joe's lives before and after the Civil Rights Act was passed in 1964. Using historical facts learned in previous lessons and the book, I would ask them to compare/contrast what they could and could not do and what their daily life would look like. What changed? What stayed the same? They would write their response in a PowerPoint or Prezi presentation that they could share in class.